The Flash, or simply Flash, is a comic book hero who first appeared in 1940. Known for his super speed, the character was given the nickname, “the Scarlet Speedster”. Throughout the years a number of different characters have assumed the mantle of the Flash, including Jay Garrick, Barry Allen, Wally West and Bart Allen. Alongside The Flash, you’ll also find three of his arch enemies, in Captain Cold, Gorilla Grodd and the Mirror Master, who each play host to an option in the free games feature. The Flash Velocity is a colourful and engaging superhero-themed gambling machine, where you’ll choose from one of three exciting and rogue-based bonus features. A comic-book style, hand-drawn metropolis setting featuring five reels. A speedster feature, where non-wilds will quickly transform into wilds. Land three bonus symbols to activate the ‘Rogues Feature’ free spins bonus round. Choose one of three rogues, each with their own individual take on how a free spins feature should play out. Captain Cold – Any time the Flash appears; Captain Cold might freeze the reel into an expanding wild and you’ll enjoy a free re-spin. Gorilla Grodd – Gorilla Grodd appears and will teleport a single wild into a random position on every free game. Mirror Master – After any of the free games, the mirror master may alter time! He’ll turn the clock back and you can replay the last four spins. The Speedster feature is randomly awarded throughout the base game. This feature simply sees the Flash appear on the reels, where he’ll turn one or more symbols wild. Yes, it’s quite a straightforward feature, but that isn’t to say it won’t be money spinning! The Flash Velocity features a larger than usual 5×4 reel configuration and pays from left to right. The Flash wild symbol is the highest payer in the game, worth 10,000 coins for the maximum five in a row. Any time you win with the wild symbol during the base game, a multiplier of up to 3x will be applied to the win. The rest of the symbols are a good combination of the rogues, more images of Flash and playing card symbols ranging through J, Q, K and A. Players can opt to activate the bonus bet option. This will cost more than your normal coin amount, but those wild multipliers can increase to up to 5x during the base game. During any of the three bonus features, those wild multipliers increase to up to 10x. At first glance, the backdrop looks like a standard city scene in a comic book, with high rise building looming large in the sky either side of the reels. But look below the reels and you can see that there has been a major incident on the road – imagine the Incredible Hulk stamping on the road and you’re there (apologies for mixing up the comic book universes there!) Enter the free spins feature and the backdrop changes to a strange rock formation in the sky. Throughout this NextGen Gaming designed poker machine the symbols reflect the comic book characters perfectly, while they’ll come to life during the features. The up-tempo soundtrack adds to the all-action atmosphere of the game. Will The Flash Velocity Pokies See You Speed to Win after Win? 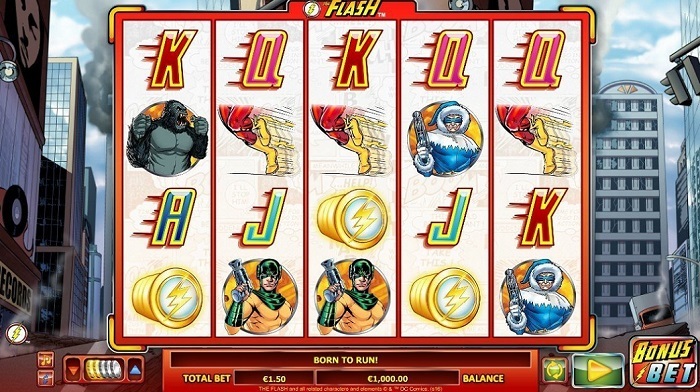 The Flash Velocity is an entertaining online pokie that will certainly appeal to all comic book fans and more. The game is colourful from the start, and the mix of the hero and his villains is an enjoyable one. In a nice twist, you’ll choose from one of the three rogues when entering the free spins feature. The choice is a good one, as all three options give the game a very different feel, adding a nice level of variety. With the speedster feature and the bonus bet option, there is a lot to like about this NextGen Gaming pokie.